Anglers from across the globe visit All Alaska Outdoor Lodge annually for some of the best fly fishing in Alaska. However, nearly every guest is enticed to join a bear-viewing adventure to Crescent Lake, Wolverine Creek, and several other previously-undisclosed bear dens. We pride ourselves in offering so much more than salmon fishing in Alaska. The Last Frontier is such a breathtaking wilderness filled with majestic wild animals, gorgeous mountain ranges, and lush forestry – we would be fools not to offer full and half-day adventure excursions here at All Alaska Outdoor Lodge. Bear viewing in Alaska, regardless of the location, is an incredible experience that is not easily described (but we’ll do our best!). 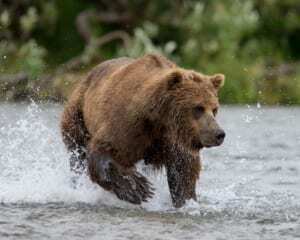 Here are three unforgettable bear-viewing adventures offered right here in Soldotna, AK. We didn’t label this day-long adventure the “Ultimate Expedition” for nothing. This guest-favorite excursion includes a little bit of everything, from flightseeing to migrating salmon fishing. You’ll depart on a floatplane and fly over some of the most beautiful places in Alaska, including rugged mountains, active volcanoes, unnamed glaciers, and, of course, wild brown and black bears. The floatplane will make regular landings in remote rivers and lakes so guests can stretch their legs, snap photos, enjoy a picnic, and even throw a line in the water for salmon, northern pike, and rainbow trout. You’ll learn why Native Alaskans honor and respect this land as you cover hundreds of miles in mid-air. While it’s not guaranteed, we’ll likely spot brown and black bears feeding in these rivers, lakes, and creeks. During August and September for only $475 per person, we offer guided fly-in trips to Crescent Lake, one of the most beautiful places in Alaska. Crescent Lake provides some of the best bear-viewing in Alaska. You’ll start by throwing your line into the still, teal water in hopes of reeling in a monster lake trout, colorful Dolly Varden, or a feisty silver salmon. This tranquil mountain lake is home to a thriving brown bear population, who feast on a wide variety of fish at the end of summer. The brown bears in this region will often usher their adorable cubs into the lake. You’ll be able to snap photos inside a comfortable 18-foot aluminum boat. Perhaps the most famous bear viewing in Alaska takes place at Wolverine Creek. Your floatplane will venture across Cook Inlet into the Big River Lakes region. This short, skinny creek sees an incredible number of brown bears every day during the summertime – thus thousands of anglers and tourists alike visit Wolverine Creek each year. Wolverine Creek is teeming with spawning salmon at various times throughout the summer, which is what attracts these majestic animals. Your fishing boat will sometimes get within ten feet of these well-fed bears. You’ll also be able to spot the spawning salmon by merely looking into the clear creek. Snap photos, shoot a video, and throw a line into the water! Depending on the weather, the trip typically takes 5-7 hours. To learn more about our various Alaska fishing trip packages, please give us a call today at 1-907-953-0186.